Can the country of Henry Ford and eight lane highways really be on the verge of embracing the bicycle? Well words are one thing, action on the ground is another. But, in the past few decades, there has been a remarkable growth in the number of bike sharing schemes across the world. Generally bike sharing schemes didn’t get off to the best start. Cities like Amsterdam and Cambridge which offered free bikes, typically saw the noble endeavour of offering 500 free bikes taken up mainly by bike thieves who promptly stole the bikes, leaving only good intentions and critics claiming vindication bike sharing could never work. 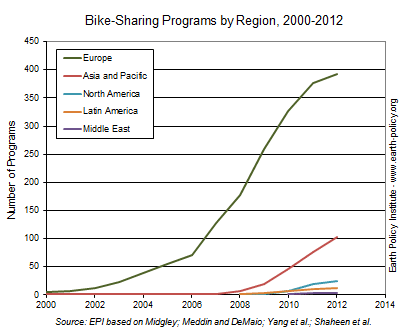 However, since then there has been a steady evolution of bike sharing schemes. With better technology and good administration enabling bike sharing schemes to have varying degrees of success. It is no longer a fringe idea of cycling nuts. American mayors are looking to embrace these eye-catching (and possibly vote winning) schemes. 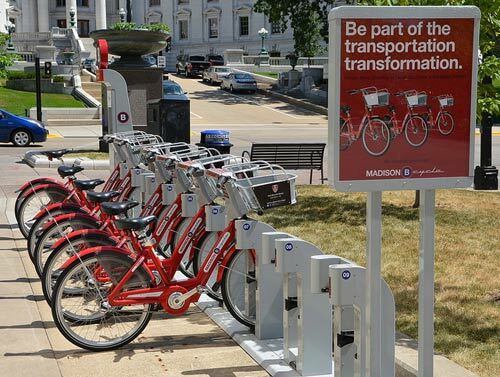 Cities with bike sharing schemes have not exactly gone Dutch, there is no cycling nirvana; but t in cities which have really embraced the bike sharing idea, there is a noticeable shift in cycling rates.